If you are a sport fisherman looking for big game fish in the balmy tropics, a commercial fisherman or fish farmer working the stormy seas of the north Pacific or a fly fisherman casting from the shore of a swiftly moving stream, West Coast Weather Vanes offers a wide variety of fish and fishing weathervanes from which to choose. Seafood purveyors and even lawyers, with whom our shark weathervanes are especially popular, see something to like among our offerings. 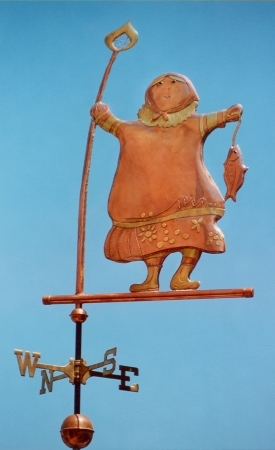 If we have not yet made the perfect fish weathervane to fit your needs, our specialty is custom weathervanes so whether you are an angler wishing to display your passion or a spouse looking for the perfect birthday gift, please give us a call. We are in the process of adding all 800 existing weathervane designs to our site. Rest assured that if you don’t see an old favorite here yet, we still have it! Just give us a call 831.425.5505 for details.